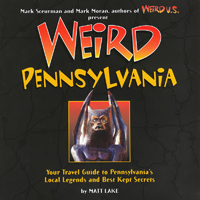 been observed all over the world (there are gravity hills documented in Scotland, Portugal, Barbados, Australia, and Korea), but true to form, Pennsylvania offers several. And one of them is so feted that Bedford County has produced a tourist leaflet to help people find it. A little knowledge of physics and a little personal observation will tell you the obvious: Unless something holds them up, objects tend to accelerate downwards. Gravity is a force of nature that even babies understand instinctively, and that even inanimate objects obey without question. And yet there are places in the world in which the laws of gravity seem to be broken regularly. They go by many names: gravity hills, gravity roads, mystery spots, or spook hills. But they all work in pretty much the same way: If you put your car in neutral on one of these roads, slowly but surely, it begins to move uphill instead of down. This phenomenon has been observed all over the world (there are gravity hills documented in Scotland, Portugal, Barbados, Australia, and Korea), but true to form, Pennsylvania offers several. And one of them is so feted that Bedford County has produced a tourist leaflet to help people find it. The attraction of gravity hills is plain. You can pour water onto the roads or roll a ball or bottle downhill, and see it stop and begin to roll uphill. You can (if you’re careful and obey traffic regulations) sit with your car in neutral and experience the phenomenon for yourself. It feels disorienting, but quite pleasantly so. Of course, skeptics dismiss the gravity hill phenomenon as the result of an optical illusion. A road that appears to go uphill may in fact be pointing down, which would account for the weird feeling of disorientation that some visitors report. That may indeed be the explanation—but unless you’ve been to one of these places yourself, armed with surveying equipment for good measure, how can you be sure? As you strain your ears to hear the laws of physics being shattered, put your car in neutral (after checking behind you for oncoming traffic, of course) and take your foot off the brake. Your car will roll uphill. Some people like to take water or various other non-flammable, bio-degradable liquids and pour them onto the road. The liquids will flow uphill. The first time we tried to check out the Gravity Hill, we just looked for New Paris on the map and chanced it. Not a good approach. The next time we took the guide, and found the spot—a stretch of road between two sets of the spray-painted letters “GH.” We’d probably have missed it again, but for the spring-break revelers rolling basketballs, baseballs, and empty soft drink cans up (or was it down?) the hill. The parents were indulgently watching their children having a blast. For the benefit of those who miss the open hours of the Bedford County Visitor’s Bureau, here are the directions to the mystery spot: Before you come to the town of New Paris on Rt. 96, you’ll come upon a small metal bridge. Turn left just before this bridge onto Bethel Hollow Road or S.R 4016. Drive for 6/10th of a mile and bear left at the "Y" in the road. After another 1 1/2 mile, you'll come to an intersection that has a stop sign. Bear right onto this road and drive two-tenths of a mile and look for the letters "GH" spray-painted on the road. Go past the first "GH" about .1 mile and stop before you get to the second spray painted "GH". It’s a bumpy ride to get there, but it’s worth a trip. Bedford is a tiny little town, Central Pennsylvania hick town, but they have quite a few things to see for seekers of the strange. First of all, there's a Gravity Hill there––I'm a big fan because it's not like the ridiculous Mystery Spot places that have all that tourist jazz around them. In North Park north of Pittsburgh, there’s a golf course with a nearby hill. That hill has a gravity road on it. It’s just a short hop from the Blue Myst Road, so you can take them both in on a single trip. And for my money, the Gravity Hill’s more interesting. –Morgan F.
Bucks County’s Gravity Hill is one of Pennsylvania’s legendary places. 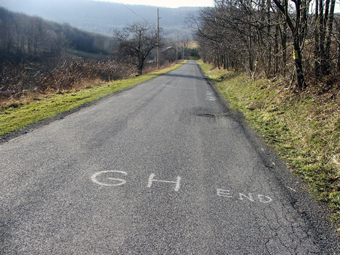 On maps, this Gravity Hill is Buckingham Mountain, located in Buckingham Township, near the Mount Gilead African Methodist Episcopal Church. There, with a blatant disregard for the laws of nature and physics, things are said to roll uphill—cars, water, you name it. And dark legends say black magic and other evils are behind these amazing powers. The church and graveyard at the hill are said to be the stamping ground of local Satanists, and there’s a cursed tombstone in the graveyard. As the story goes, once you touch it, you’re supposed back towards the cemetery fence to run as fast as you can and hop over it. This dash is a race with the Devil himself, and if you lose, you will be cursed with bad fortune immediately. Some say it means certain death. Be that as it may, the gravity hill itself, which is on the other side of the hill from the Mount Gilead church, has all the regular features of a gravity hill—except for the pleasant sensation as you roll uphill, of course. 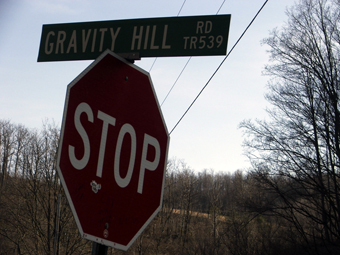 Buckingham Mountain isn’t the only gravity hill with sinister tales attached to it. Just off Route 219 in Brandy Camp, Elk County, is a gravity hill that’s supposed to be haunted by spectral quadrupeds. Before you perform your uphill-in-neutral stunt, roll down the window and keep an ear open. They say you’ll be able to hear a horse galloping off in the distance. As your car rolls uphill, you can distinctly hear hooves clopping against the asphalt. Either that, or you have a couple of Monty Python fans with coconut shells in the back seat!